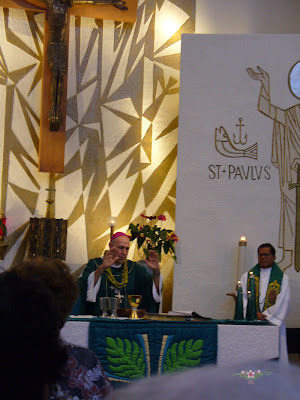 Hau`oli la Hanau Bishop Larry! 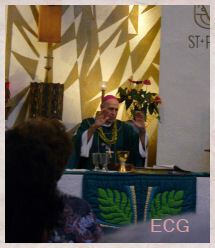 Just wanted to wish our beloved bishop Larry a very happy and blessed birthday!! May God bless you always abundantly!! 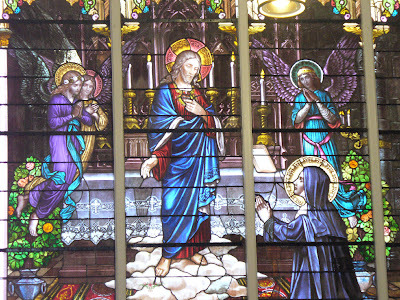 This beautiful stained glass image of The Sacred Heart of Jesus and Saint Margaret Mary Alacoque can be found at Sacred Heart Church, Honolulu. 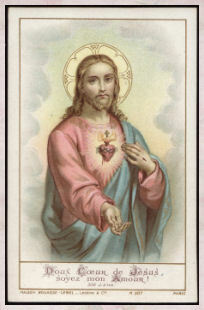 Please be sure to visit EWTN's page learn more about devotion to the Sacred Heart of Jesus and the Immaculate Heart of Mary. 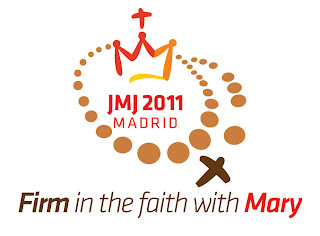 People of all ages are being encouraged to pray the Rosary every Saturday in the run up to World Youth Day 2011 in Madrid. The Firm in the Faith with Mary Rosary campaign, which has been organized by Family Rosary International working with Aid to the Church in Need (ACN) and other Catholic organizations, is asking people to pray the rosary for conversion, deepening of faith and commitment to follow Christ for those attending World Youth Day (16th-20th August). Fr. Phalan developed the plan in conjunction with Javier Menéndez-Ros, National Director of ACN-Spain, in October 2010. “When we brought our strategy to the WYD organization, they gave it their blessing right away,” he explained. 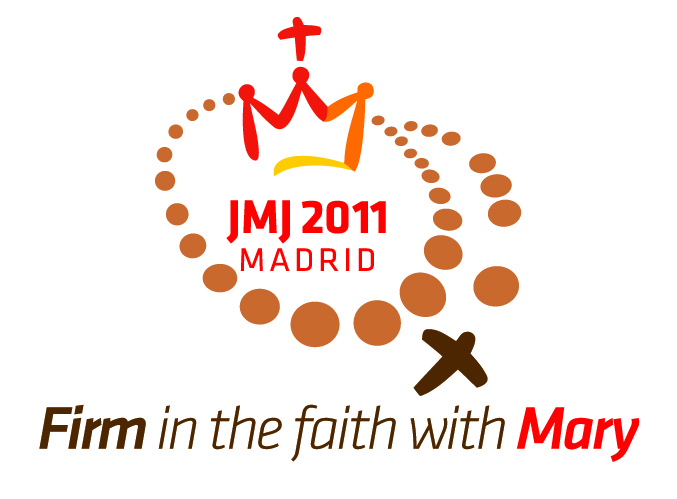 In addition to receiving approval from the WYD organization in Madrid, the campaign also received the backing of the Vatican’s Pontifical Councils for the Laity and for Social Communications. Social networks and other media such as Twitter and Facebook have been used to promote the prayer initiative. As well as being able to pledge to pray the rosary by visiting www.firminfaith.org supporters can record themselves praying a decade of the rosary and upload it to the campaign’s YouTube channel. Fr. Phalan reported that more than 700 people from 55 countries have already signed up online and many more have indicated that they are saying the rosary every Saturday for the success of World Youth Day. Fr. Phalan went on to describe why Saturday in particular had been chosen for this initiative. In conclusion, Fr. Phalan emphasized the importance of WYD 2011 and stressed the importance of prayer as a way of preparing for it. 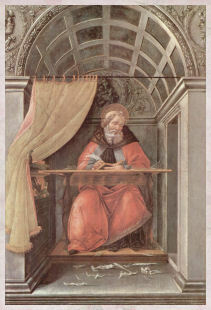 "...Much has been said and much is known of how this holy priest spent untold hours (even to sixteen and more hours a day) in the confessional. That he could “read souls” is well attested by testimony even from before his death. 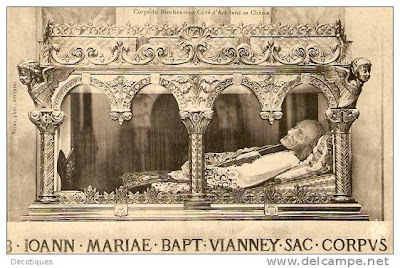 It has even been related that the evil one once cried out, 'If there were two priests like John Vianney, my kingdom on earth would crumble!'..." 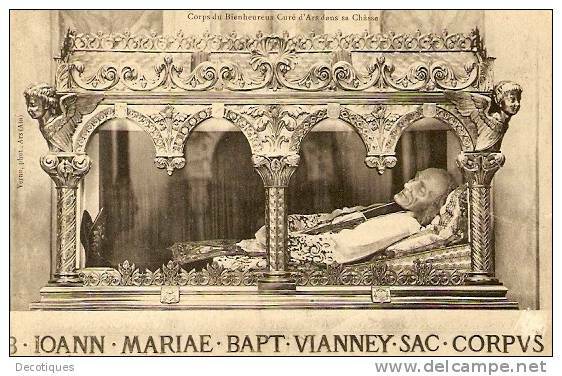 "Saint John Vianney, when asked how long he had loved Mary replied "I loved her almost before I could know her." 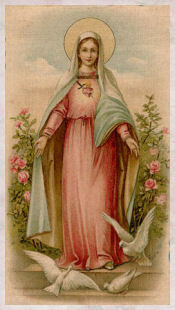 help me, combat for me, and obtain for me the pardon of all my sins. and fight for me against the enemy. and never let me despair of the mercy of God. when I can no longer hear human words of consolation, do thou comfort me. and admonish my friends to procure for me a speedy enjoyment of the blessed sight of God. I may there bless and praise my God and thee for all eternity. Amen. Father Sean Coyle wrote a wonderful post about another priest in prison, one who was imprisoned for his faith, François-Xavier Cardinal Nguyên Van Thuán. Both priests were falsely imprisoned. Both priests are/were imprisoned for a very long time. Both priests never gave up hope. Both priests showed the power of forgiveness at work. A leading Catholic bishop in Iraq has spoken of his people’s shock and courage after a car bomb outside a church left 13 people injured. Archbishop Louis Sako of Kirkuk said he and his faithful “will never stop witnessing to Christ” in spite of the bomb which went off directly outside the Holy Family Syrian Catholic Church in Shaterlo, a poor and densely populated district in northern Kirkuk. The explosion, which took place at about 5.30 am, Tuesday, August 2nd, was so severe that people asleep in nearby homes were injured by falling glass and other debris. According to reports received by Catholic charity Aid to the Church in Need (ACN), the 13 people injured in the blast included a 20-day-old baby. Fr. Imad Yelda, from Holy Family Church, was also slightly hurt. Of those injured, all but one, an elderly man, were released from hospital shortly after receiving treatment for cuts and other minor ailments. A number of homes were damaged in the blast, a couple of them seriously. The explosion was made worse because the car bomb exploded next to an electricity generator close to Holy Family Church. The blast blew a hole in the side of the church. In an interview with ACN, Archbishop Sako said the devastation could have been far more serious, with reports of a bomb that failed to detonate close to another church in Kirkuk. Respected Catholic news agency AsiaNews reported local sources claiming that a second bomb was found in a car parked near a Presbyterian Evangelical church at al Mass, in central Kirkuk. The bomb was reportedly ready to explode but was defused. He said that the attack came in the middle of a summer conference held in Kirkuk Cathedral for students to examine religious and other subjects. He said that Wednesday, August 3rd, he was due to meet Muslim leaders, both Sunni and Shia, to ask imams of mosques across Kirkuk to condemn the atrocities. Archbishop Sako said the attackers’ identity was unclear but added that their motive was probably political. Kirkuk, which has a population of 900,000, is at the center of an ethnic-political struggle between Arabs, Turkmen and Kurds. The latter want the city annexed to Kurdistan, while Arabs and Turkmen want it to remain under the control of Iraq’s central government. 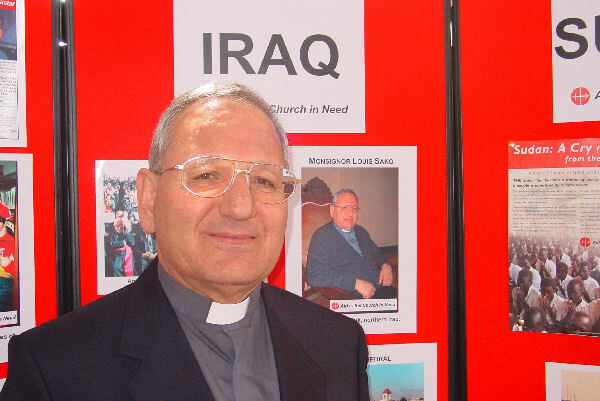 As a Catholic charity for persecuted and other suffering Christians, Aid to the Church in Need has prioritized help for Iraq and has provided support for Kirkuk Cathedral and the cathedral hall, providing conference facilities. The charity has provided help for Sisters, seminarians and Mass stipends as well as aid for refugees and displaced people. What a beautiful song! Mahalo Ed. 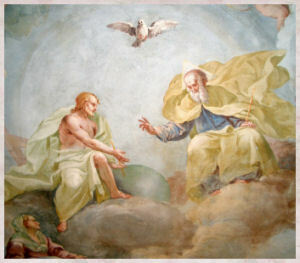 I am very happy to see that Pope Benedict stressed the importance of spiritual direction. This idea is not a new one for me. I have been trying for years to find the right spiritual director. A few priests that I approached simply told me that they were too busy. I respected that. One dear priest accepted my request to become my regular confessor. Back then I thought a spiritual director and regular confessor would be the same person. This is not so. Unfortunately, he did not work out. 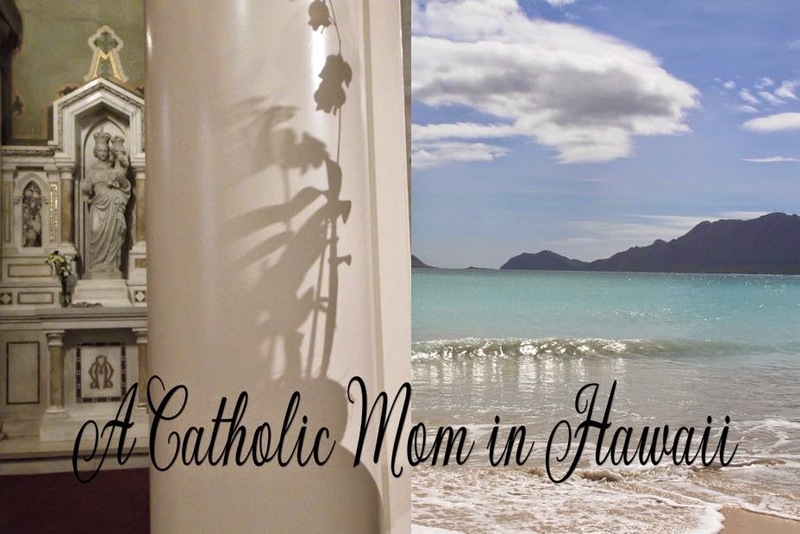 I was looking for someone to guide me to a more holy life in my vocation as a wife and mother. What I received was reassurance from a very kind and non-judgmental priest that I was doing fine . Before you know it, I stopped making appointments. Maybe if I had known the difference between a regular confessor and a spiritual director, it would have worked out. I may have been looking for another Padre Pio and this was not at all fair to Father as either a confessor or spiritual director. I realize that a spiritual director does not have to be a priest. For me at least, I think a priest's spiritual direction would benefit me very much. Informally, I receive spiritual direction from my mother. I really value her guidance and wisdom. She also seems to know me very well, including my faults and weaknesses, as well as strengths and virtues. But I still wanted a priest to guide me. 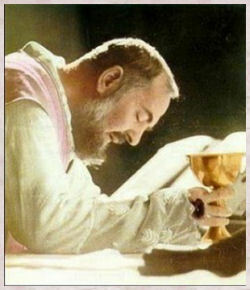 A few years back, I decided that I was going to ask St. Padre Pio to be my spiritual director. 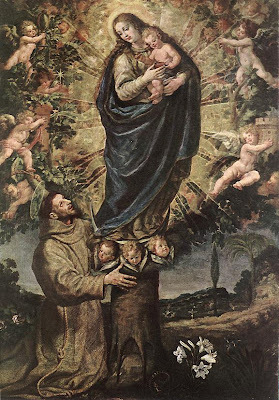 Even though he was no longer on earth, I had already asked him to accept me as his spiritual daughter, so I thought this was divine inspiration guiding me. He is actually a very good spiritual director. 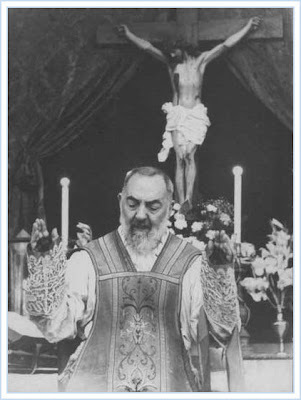 Along with St. Padre Pio I rely heavily on Blessed Mother, the Holy Spirit and Jesus to help me and to guide me. I found an article by a priest on the topic of spiritual direction. He also included what to do if you cannot find a spiritual director. New Theological Movement's When You Cannot Find a Spiritual Director The writer shares valuable advice. Please be sure to read it if you are looking for spiritual direction. What if I cannot find a suitable spiritual director? We must first state that it would seem to be better to have no director at all than to have an unsuitable one – so long as the terms of “unsuitability” are primarily those which have been enumerated in my previous article and are not merely our whimsical fancies. It would be better to have no director at all than to have one who is unfaithful to the Church’s spiritual tradition – Far better to struggle alone up the mountain, than to be dragged down into hell with a companion! On the other hand, we must be realistic and recognize that our director does not need to be another St. John of the Cross, we simply need someone who is learned, faithful, and prayerful (and who is willing to take us on as a directee). That being said, it is often the case that no suitable director is available. Often, the director we might desire is exceedingly busy – in this case, we must add, it never hurts to ask if he can take us on anyways. Moreover, I would add that any good director will be busy, but he will also have a generous heart. 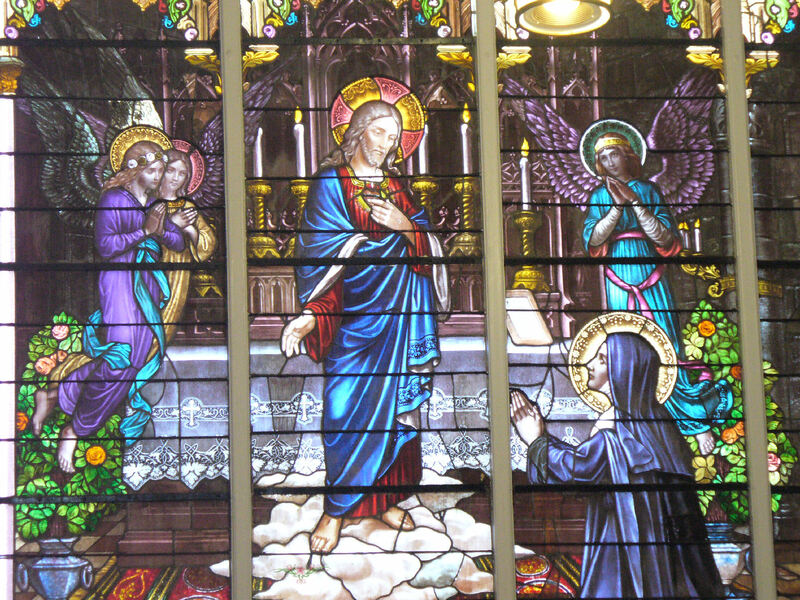 Also, there may be a place for direction through written letters or even over the phone – remember that St. Gemma often had her guardian angel deliver letters back and forth between her and her director! If we cannot find a director, and we are convinced that we need one, we must first turn to prayer and mortification. 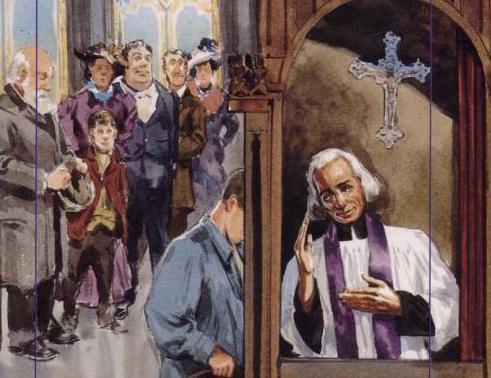 Through prayer, fasting, mortification, and works of charity, we will merit a good director! Perseverance is the key, we must not stop asking God to give us a good director; he will surely answer our prayers. But what ought we to do in the meantime? 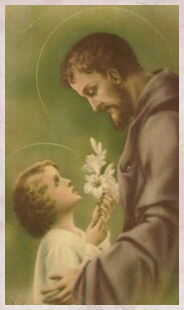 Today is a big feast day for the Franciscans. 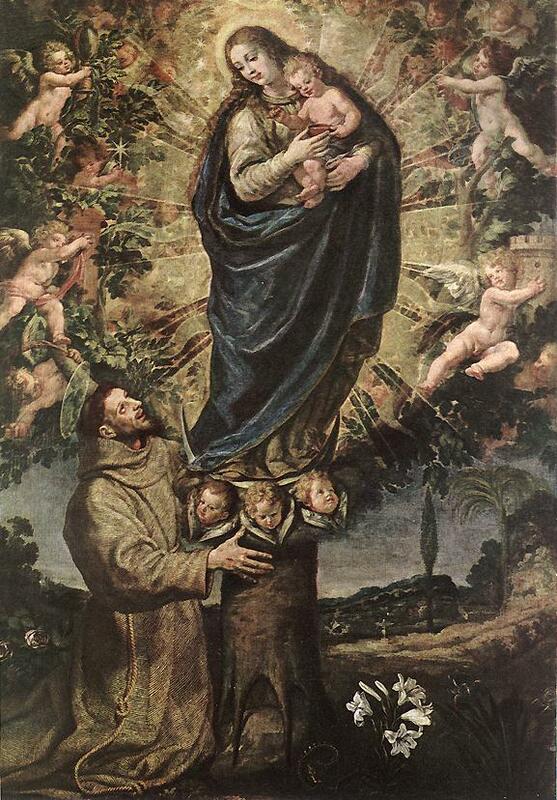 It is the Feast of Our Lady of the Angels. It is also the day when we all can receive plenary indulgence also known as the "Portiuncula Indulgence". 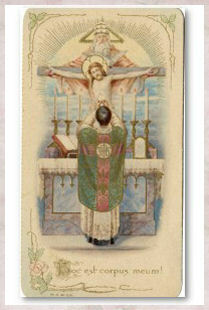 - Participation in the Holy Mass and Eucharist. 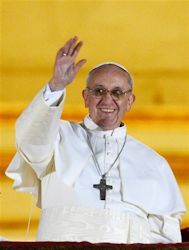 - A prayer for the Pope's intention, in order to reaffirm one's membership in the Church, of which the Roman Pontiff is the foundation and sign of visible unity. 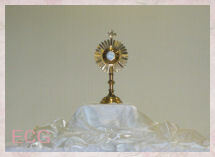 To learn more about the Portiuncula Indulgence, please visit the Franciscan Friars T.O.R. And, a big mahalo to Betty sending me a reminder yesterday! 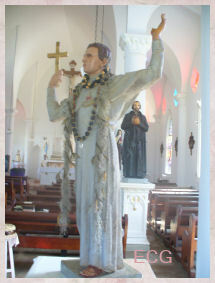 The founder of the Redemptorists just happens to be one of my favorite saints. I have had crosses in plenty-more than I could carry, almost. I set myself to ask for the love of crosses-then I was happy. 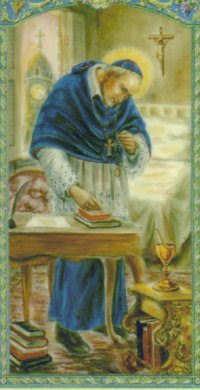 St. Alphonsus Liguori came from a distinguished family in Naples. He gave up being an accomplished lawyer, for the priesthood. 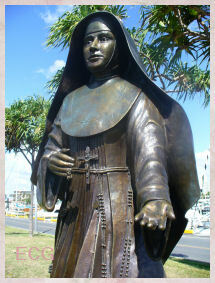 In 1732, he founded what is now known as the Redemptorists. 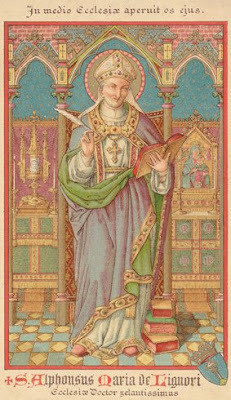 Because of many difficulties and misapprehensions, St. Alphonsus was condemned and removed as their leader by Pope Pius VI. He was appointed bishop in 1762 and governed the small diocese of Sant' Agata dei Goti with "great wisdom and industry" until forced to resign in 1775, due to poor health. The difficulties with the Redemptorists became even more troubling to him after this time. Yet St. Alphonsus found the time to devote himself to ascetical and moral theology. It was during the last year and a half of his life that he was tormented "with the most fierce spiritual trials, but he died in peace in 17687, within two months of his ninety-first birthday. He was declared a doctor of the Church in 1871. The greatest glory we can give to God is to do his will in everything. Our Redeemer came on earth to glorify his heavenly Father and to teach us by his example how to do the same. 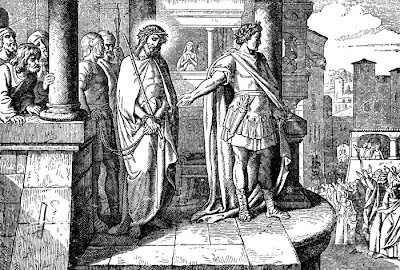 St. Paul represents him saying to his eternal Father: “Sacrifice and oblation thou wouldst not: But a body thou hast fitted to me . . . Then said I: Behold I come to do thy will, O God.” Thou hast refused the victims offered thee by man; thou dost will that I sacrifice my body to thee. Behold me ready to do thy will.